I know it seems like a stale topic, but thanks to the (2008) Republican Presidential race, the subject is rearing its ugly head again. Earlier this past week, Presidential non-candidate Fred Thompson once again bravely stood up to his opponents from the safety of behind his desk and lobbed insults worthy of a twelve year old at Senate Majority Leader Harry Reid after he criticized the newly ousted Joint Chiefs of Staff Peter Pace on a radio show that also included comments by 9/11 Conspiracy defenders. 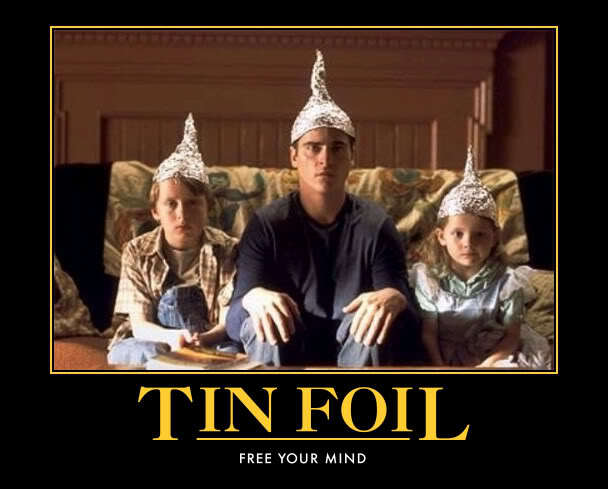 Thompson lumped the Majority Leader (and by extension, ALL Democrats) in with the “tinfoil hat, UFO believing” crowd. Apparently now, the next “dirty trick” to come out of the GOP will be painting Democrats as a bunch of crazy “9/11 conspiracy nuts”. Unfair as the portrayal may be, I think it IS safe to say that more “9/11 Conspiracy Believers” vote Democrat than Republican. Air America radio host Thom Hartman commented last week that he has received well over 150 emails from people who are willing to go on his show to debate evidence that “9/11 was an inside job”, but not one email from anyone willing to take the opposing view debunking those claims, which prompted me to write this weeks column. More than 1/3 of all Americans believe the U.S. government was somehow involved in the attacks of 9/11. That’s certainly not a “fringe”, but it IS against “common sense”. I’ve had a beef with 9/11 Conspiracy Theorists for a long time now, mostly because of how easily and readily they accept arguments and suppositions as “fact” that don’t stand up to even the most cursory analysis. Yet the true believers continue to believe, making the rest of us look bad. And it is SO easy to believe when you/we distrust the Bush Administration SO much that we are willing to believe they are capable of just about anything. Now, don’t get me wrong. I’m not about to argue that the Bush Administration *didn’t* take advantage of the events of that fateful day, nor am I above entertaining the idea that they *may* of even allowed it to happen… though probably never knowing the extent of the attack to come… in order to use it to their advantage. There is plenty of evidence out there to support both ideas. My “Liberal Democrat” bona-fide’s need no defending, having produced this blog for nearly a year now, maintaining the BI30 video archive that this blog is the companion to since 2004, and a lengthy collection of videos on YouTube (all links above) exposing the crimes, failures and hypocrisy of the Bush Administration, there should be no question that I am NOT defending the Bush Administration with this report. But what I DO criticize is ANY idea that “9/11 was an inside job” and that the Bush Administration, and NOT religious extremists from the Middle East, attacked us on that day. Yes, I’ve seen all the films (“Loose Change“, “In Plane Site“, “Pentagon Strike“, etc) and have found fault with them all. These films and the “facts” depicted in them are easy to accept if you are already willing to believe. It’s no different than watching a magic show when you already believe in magic. It’s fun to imagine the elephant just disappeared into thin air. But logically, you KNOW there is no such thing as magic, you KNOW it’s really a trick, and you KNOW elephants don’t just dissolve into nothingness. But we believe because we WANT to believe. Such are the 9/11 Conspiracies. And just as we always feel a little stupid and let down when a magician reveals his secrets, so goes the 9/11 Conspiracy theorist… difference being that when a magician reveals his tricks, you don’t want to punch out the magician. But challenge a 9/11 conspiracy “true believer” regarding their fragile and well fed beliefs, and often you are asking for trouble. I felt the need to create this list now because of recent attempts to label Democrats as moonbats… people out of touch with reality. The Right is more and more often now trying to destroy the credibility of anyone that still doesn’t get “the genius that is the Bush foreign policy” (pardon me while I gag) because it works. Don’t have a leg to stand on? Take the weakest branch of your opponents base and flog him/her with it until they cry for mercy. Remember that I do this for your own good. 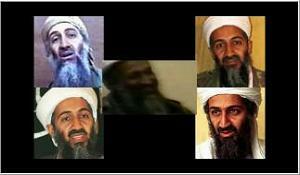 Myth #1: The Bush Administration themselves actually orchestrated 9/11 and pinned the blame on Osama bin Laden. This is the core belief. If you don’t believe this, then none of your other theories will make any sense. 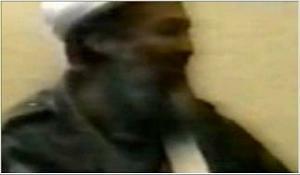 You MUST believe OBL was “framed” if you are to believe the Bush Administration is actually responsible for the attacks. There’s no other way around it. It’s an odd position 9/11 Conspiracy believers find themselves in… defending Osama bin Laden in order to blame someone they hate even more: George W. Bush. The theory goes this way: OBL first denied that his terrorist organization, al Qaeda, was behind the 9/11 attacks. And later video showing him accepting responsibility for the attacks look nothing like him. It was only after being seen as a “hero” in the Muslim world for the spectacular attack that he willingly accepted responsibility for something he didn’t do because it was beneficial to him. 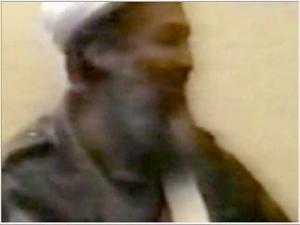 Correcting for color/brightness and stretching out the image to its true proportion, it is easy to see that the man in the video is indeed bin Laden. No question about it. 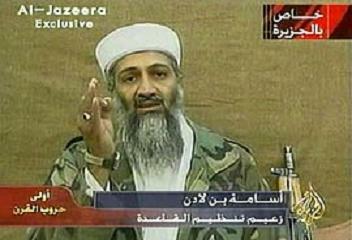 As you can plainly see, it is indeed bin Laden claiming responsibility in the video, gesturing with his right hand while wearing a gold wedding ring. Dissecting videos such as “Loose Change” for inaccuracies would take FAR more space than I have here, but if you want more, there are about a half dozen good sites out there that do. Which brings up another obvious point: Why blame “bin Laden” specifically? George Bush and his neocon buddies from the “Project for the New American Century“ (PNAC) had been after Saddam Hussein since the last Gulf War, even urging President Clinton to invade Iraq and depose Saddam back in 1998. 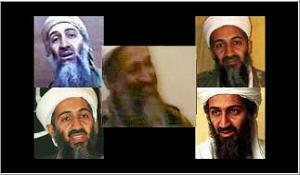 If they were going to frame anyone for the attacks of 9/11, it would of been Saddam, not bin Laden. Going after the Taliban in Afghanistan was a distraction from what they were really after: Saddam and his imaginary “Weapons of Mass Destruction”. If they were going to “frame” someone for 9/11, it most assuredly would of been Saddam Hussein (Hell, Cheney is STILL trying to link Saddam to 9/11 to this day). If, in light of this new evidence, you are massaging your theory to now believe “Bush and his close friends the bin Laden’s planned 9/11 together“, they STILL would have framed Saddam for it. Tell me, what’s easier to believe: the most inept administration in U.S. history pulled off the most elaborate conspiracy in history, involving thousands of military, government and civilian participants, a mere eight months into office, without anyone coming forward to confess their involvement and without any physical evidence of their crime? The most inept administration in U.S. history “dropped the ball and failed to prevent the most deadly terrorist attack in U.S. history” despite literally *dozens* of warning signs, a Presidential Daily Briefing entitled “Bin Laden Determined to strike in US” and a Terrorism Czar (Richard Clarke) unable to get the Bush Administration to even sit down and TALK about al Qaeda until September 4th, one week before the attacks on 9/11? Myth #2: The Towers came down as the result of a “controlled demolition“. I think this theory irks me most of all. People with no more training in “structural engineering” than I do in open-heart surgery can look at the video of those towers coming down and declare with all the authority of Bill Frist diagnosing Terry Schaivo from a 10-minute video, that the way they fell is “concrete proof” of a controlled demolition. First, I’m not aware of a single example of a skyscraper collapsing on its own for which to compare what such a collapse should look like. A skyscraper wouldn’t fall “straight down”? Who says? Bob from down the street? I’d argue that, had the building fallen ANY other way, THAT would be evidence of foul play. Realize that neither of the towers were damaged at their base, which might result in them toppling. 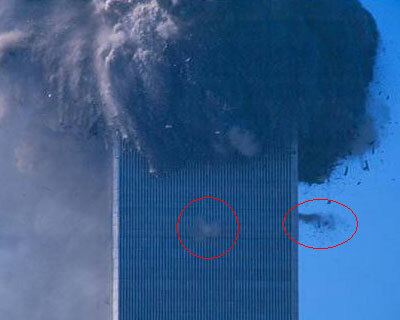 Both towers were struck near the top and pancaked straight down. For the Towers to have fallen to the side, basic physics dictates that a force equal to the weight of the buildings would of had to of pushed them over from the side. The force of the planes were the only force applied to the sides of the buildings, which did not fall for at least another half hour afterwards. The first plane hit dead-on in the middle of the floors, distributing the damage fairly equally, creating no imbalance. The second plane struck closer to the corner of Tower Two, and as a result Tower Two DID collapse in on that corner first, toppling towards the side before the weight of the top floors collapsing downward brought the rest of the building straight down. For any building to “topple” something needs to push it over or support must be removed from one side “at the base“. Once a building starts to fall, it’s going to come straight down as the floors above come crashing straight down. Accounts of “explosions” heard inside the Towers can likewise be explained away by combusting chemicals, “backdraft” as air trapped inside empty offices/closets/etc with closed doors are suddenly breached by fire, and/or just the sound of unseen internal structural damage taking place (steel girders snapping like twigs). “Loose Change” points to “jets of smoke” they call “squibs” seen shooting out of the sides of the building just below the collapsing floors, pointing to them as *concrete proof* of a controlled demolition as pre-installed charges appear to be set off, collapsing each floor above. Two problems here: First, had someone of “planted” explosive charges inside the Towers to trigger a collapse, they would of had to of known EXACTLY where the planes would hit… down to the exact floor… to know where to place the charges. There were no flames in these “squibs” that would be associated with an explosive charge, no “squibs” appearing “20 or 30 floors below the points of impact”, and no “squibs” appearing *before* the Towers had already started to come down to have triggered the collapse (if the buildings needed assistance to fall, the time they would of needed it most was *before* the collapse even began). No examples of “squibs” before the collapse begins have been produced (photos of what some “claim” to be of squibs prior to the collapse have been shown, but what is seen in the images do not resemble the “jets of smoke” seen above. Nor is there any way to know exactly *when* the photos were taken to prove that the building had not already begun its collapse to produce the smoke). So what then were those “squibs”? Most likely, air inside the building being forced out the sides as the floors above compress the air inside them down and out. Following the paths of least resistance, air would be pushed down elevator shafts and halls, shooting out open windows wherever it finds them. Notice there is no fire or flame in those “squibs” to suggest they are the result of a detonated charge capable of taking out an entire floor half the size of a football field. Arguments that “airplane fuel doesn’t burn hot enough to melt the steel supports between floors” are irrelevant as well. The steel girders between floors didn’t need to “liquefy” just to become structurally unsound enough to no longer support the weight above them. They only needed to “soften” to the point of bending, which takes place at a MUCH lower temperature well within the range of burning jet fuel. Also, the architectural design of the Towers themselves was partially to blame for their collapse. Since “vertical support beams” in the center of a skyscraper that tall would be impossible, the Towers were designed to bear all their weight on the ridged outer skeleton. People who worked in the Towers often complained of how “narrow” the windows were, making them difficult to look out of. That’s because the outer skin of the Towers were bearing all the weight, and once that was compromised, that support was gone. The problem here is that WTC7 WAS damaged in the strikes. Not only did pieces of the wreckage from the first strike on WTC-1 come out the other side and rain down on WTC-7, but so did a huge amount of building debris when the towers collapsed. WTC-7 suffered *tremendous* structural damage in the attacks, with one entire corner of over a dozen stories high having suffered damage where tons of hot steel and concrete punched its way through the Southwest corner of the building. To make matters worse, Mayor Giuliani decided the basement of WTC-7 was the perfect storage facility for two massive tanks of diesel fuel (one containing 6,000 gallons, and four more holding a combined 36,000 gallons) to be used in the city’s emergency electrical generators, which naturally caught fire and gutted the interior of the entire building. After 9-hours of raging fire, the building had become a danger to rescue workers in and around the Towers. 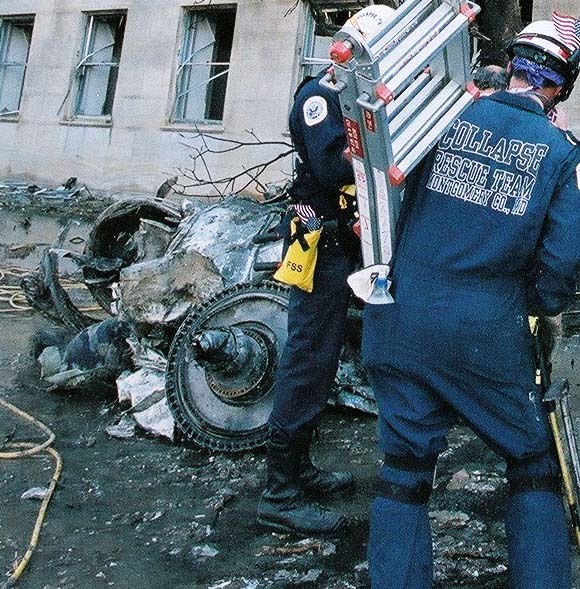 Talk of deliberately “pulling” WTC-7… an engineering term for intentionally demolishing a building… began to make the rounds, overheard by witnesses unfamiliar with the term and/or the reasons for suggesting it. However, while the decision was still being made as to whether or not building-7 should be intentionally demolished (and how? ), it collapsed on its own 9 hours later that same afternoon (as predicted). And if raging fire and structural damage weren’t enough, how about an earthquake? The entire World Trade Center complex sat atop a major subway interchange. The basement of the Towers was home to a primary NYC Subway station. The ground beneath the entire complex was “hollowed out”. So when each Tower fell, WTC-7 was subjected to the equivalent force of a 2.3 earthquake twice within the space of 30 minutes. The fate of WTC-7 was sealed almost from the moment of impact. Despite all we know about that day at the WTC, memories have a way of fading, especially when particular facts don’t fit into your theories. I recently came across a freshly posted video on YouTube showing footage of the WTC Towers that morning asking, “What Could Cause the Plumes of Smoke at the base of the WTC?”, suggesting that the video showed “proof” of something damning being caught on film. I quickly responded, “Uh, WTC-7?” Obviously, the poster forgot that “there was a 47-story building *on fire* at the base of the towers”. You’d think that I spat on grandma’s grave the way I was attacked by later viewers for pointing out the obvious. Be it religion or conspiracies, when you attack someone’s beliefs, you’re just asking for trouble. One crucial factor that is overlooked here is the quality of the camera that recorded the incident. Parking lot security cameras… even ones at high security government buildings… are of notoriously bad quality. And video is far worse than film when it comes to resolution and detail. While the image on film appears to be quite small, it is far more likely that only the glint of the sun shining off the mirrored aluminum skin of American Airlines flight-77 made an impression on the video camera sensors as it rocketed past at over 500mph, making the image appear to be that of a much smaller object. Another point made in various videos of the Pentagon strike is the presence of “unbroken windows” near the point of impact as seen above. This should come as no surprise when you consider that the Pentagon, the nerve-center of the United States military, was built to withstand a nuclear strike… windows and all. It is this reinforced structure that limited the damage as much as it did. And plunging into such a highly reinforced building at such a high rate of speed, much of the plane would have… and did… disintegrate on impact, which is why no wings or tail section is apparent in photos of the impact site. I’ve written all of this to try and tone down much of the “hysteria” that Republicans seem ready, willing and eager to use to label all Democrats as “tinfoil hat wearing, conspiracy freaks” that have no business electing the next leader of the free world. So please stop, take a deep breath, relax and remember to look at things logically long enough to let all the facts soak in, and deprive “them” of using yet another unfair characterization against us. I thought I included this earlier, but on March 30, 2017, a section of the I-85 overpass in Atlanta, Georgia collapsed due to raging fire alone. • After departing the airport at 08:10, flight AA77, mysteriously, undetected by any radar system or anyone on the ground – landed somewhere. • They removed and killed all the passengers and crew, and hid the bodies – collecting some body parts from 179 people on board. • They collected some personal effects from various passengers and terrorists. • They blew up the plane (without leaving traces of explosives) and collected some pieces of AA77 and trucked them to the Pentagon – unnoticed. • They took the Loral Fairchild F-2100 FDR (S/N DCA01MA064) from the plane to a secret expert laboratory. • They wiped all the data and re-recorded the previous 23 hours and 30 minutes from previous flights – and did it in a matter of minutes – dramatically faster than real time. • They then recorded an entire fake flight from 08:10 to 09:40 – with all the hundreds of variables – faked (covering MILLIONS of data items). And they did this within a couple of minutes – dramatically faster than real time. • Capturing and recording on the FDR MANDATORY data NOT KNOWN PRIOR TO THE INCIDENT (e.g. wind speed, wind direction, altitude, latitude / longitude, time …) as per section 2.2.2.1 Annex 6 “Operation of Aircraft”, Part I, ICAT. If the plane didn’t follow the route indicated by radar – where was this data sourced ? • Capturing and recording on the FDR optional data NOT KNOWN PRIOR TO THE INCIDENT (e.g. air pressure, altitude, latitude / longitude, time …) as per section 2.2.2.1 Annex 6 “Operation of Aircraft”, Part I, ICAT. If the plane didn’t follow the route indicated by radar – where was this data sourced ? • They had a clean up crew ensuring that ALL parts of the 757 were collected to ensure that none could be accidentally found – at this unknown airport. • They disposed of the 757 in some unknown location (at sea ) ? • They fired a missile at the Pentagon – completely undetected from anyone around the Pentagon (not a single witness seeing the missile or launch vehicle) or from any launching site or from any satellite surveillance (despite the US having the most sophisticated systems on the planet). • They sent a clean up crew to the pentagon to collect all the missile fragments – unnoticed. • They sent a clean up crew to the pentagon to cleanse it of all traces of explosives – unnoticed. • They clipped some trees near the Pentagon to simulate being struck by AA77 – undetected. • They damaged some light posts at the pentagon to simulate being struck by AA77 – undetected. 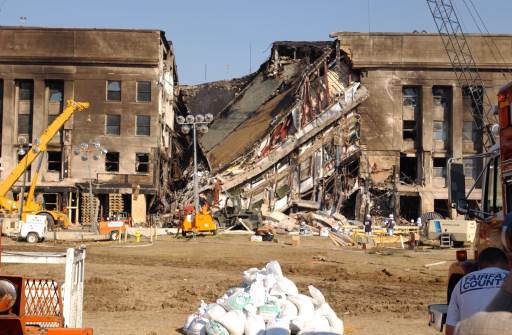 • They drove in to the Pentagon completely unseen and unnoticed – with a big truck full of aeroplane parts, and body parts from 179 people on board. • They then – despite all the people present – dumped the parts of AA77 (to ensure that the part numbers matched) on the Pentagon lawn – and inside the Pentagon – undetected. • They deposited the FDR inside the Pentagon – undetected. 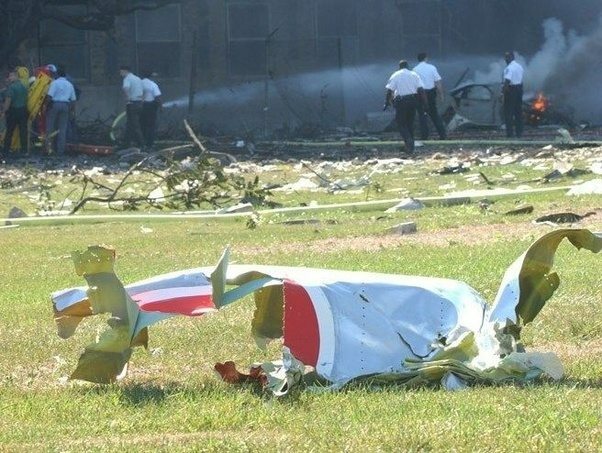 • They faked the radar recordings and data from the ground radar (FAA Air Route Traffic Control Center Radar) that had tracked the flight from take off until just prior to crashing. • They faked the radar recordings and data from the ground radar (Washington Dulles Airport Radar) that had tracked the flight from take off until just prior to crashing. • They faked the radar recordings and data from the ground radar (USAir Force 84th Radar Evaluation Squadron Radar ) that had tracked the flight from take off until just prior to crashing. • They faked the communications from the Captain to Washington ATC (finding someone to simulate his voice). • They faked the entire forensic teams and its results – when they matched the DNA to the passengers on the plane. • They ensured that ALL the people in the above conspiracy agreed not to say anything about it. • Two decades later – STILL not a single person has come forward to “admit” to being involved. • Two decades later – STILL not a single person has come forward to suggest that a friend “told them something amazing” in confidence. Sorry but if you really think that is the more plausible scenario that “a plane flew into the Pentagon” – then you are joining the Flat Earthers on my whack a doodle list. (*86) Use of autopilot – from FDR.